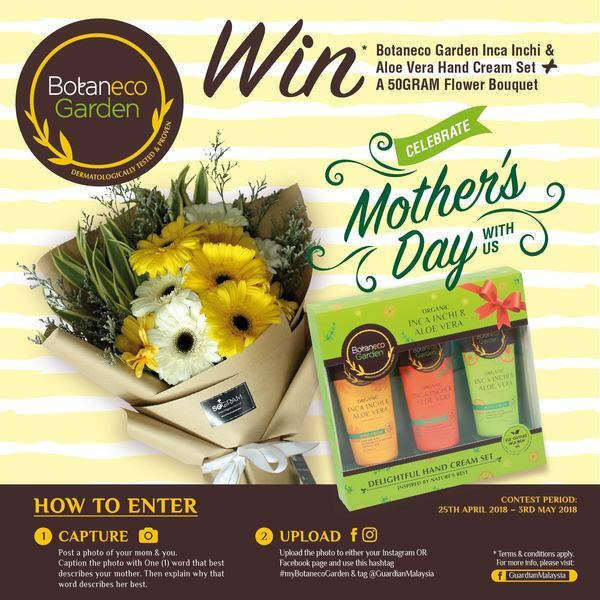 Botaneco Garden Mum + Me Mother’s Day Photo Contest X Guardian. Come and join the contest and stand a chance to win Botaneco Garden Inca Inchi & Aloe Vera Hand Cream Set + 50GRAM Flower bouquet. Take a creative photograph of your mother and you. Post your photos to either Facebook OR Instagram. Caption the photo with One (1) word that best describes your mother. Then explain why that word best describes her. Your captions can be in Malay, English or Mandarin. Include the hashtags #MYBotanecoGarden and tag @GuardianMalaysia.